In past years, CommonBound has answered the questions of what is a new economy, why do we need one, and who is it building it. 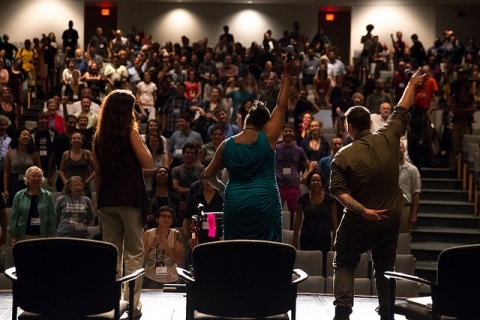 Next July, CommonBound will connect these threads and focus on another question: How do we build a new economy? We’ve learned and built on CommonBound 2016’s decentralized planning model (inspired by the Allied Media Conference). This year, NEC staff will work with our 200 member groups and allies to curate tracks so that the conference programming is shaped and reflects the communities and thought leaders building the new economy movement. CommonBound is taking place in St. Louis, Missouri, a city where local organizing is creating a vibrant and burgeoning new economy. NEC is thrilled to partner with Solidarity Economy St. Louis, a network of St. Louis organizations and individuals, to plan CommonBound 2018 and ensure it both adds fuel to local organizers’ efforts and grounds visitors in the critical work happening there. We already know that our current economy is built on theft, exploitation and oppression. Every day, our communities are faced with an onslaught of violence and repression. Just one month ago, yet another police officer was acquitted in the murder of Anthony Lamar Smith, sparking protests from thousands of people across St. Louis. But we also know that we are brilliant and capable of shaping a different world, that we can come together to create, resist, and transform ourselves and our realities.